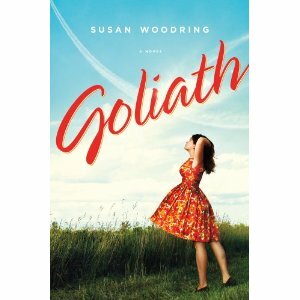 Goliath by Susan Woodring will be published by St. Martin’s Press on April 24, 2012. When fourteen-year-old Vincent Bailey stumbles upon the body of Percy Harding, Goliath’s most important citizen, near the railroad tracks one perfect autumn afternoon, the tragic death seems literally unbelievable: how could it have been a suicide? Only Harding’s secretary, Rosamond, might have had a glimmer, but that glimmer just tugs at her, urges her to find out more. Harding isn’t the first person to leave Rosamond: everybody does, from her husband Hatley, who walked out on her years ago; to her complicate daughter Agnes, whose girlhood bedroom was papered with the maps of the places she wanted to go.